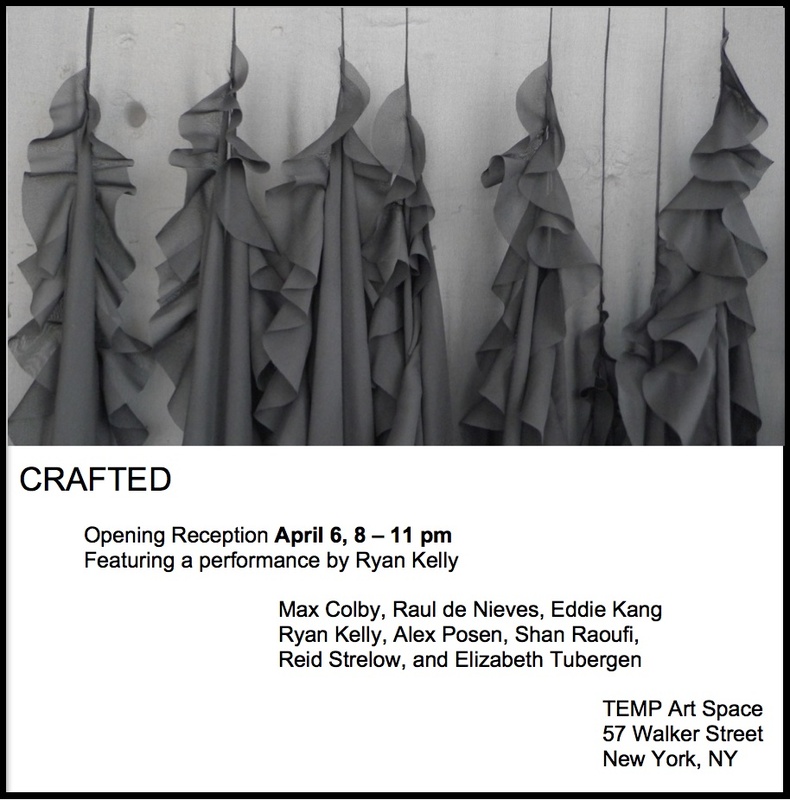 TEMP Art Space is pleased to announce CRAFTED, an exhibition featuring the work of eight artists who use various specialized technical skills – including carpentry, sewing, embroidery, and draping – to produce art. Artists include: Max Colby, Raul de Nieves, Eddie Kang, Ryan Kelly, Alex Posen, Shan Raoufi, Reid Strelow, and Elizabeth Tubergen. Taking its cue from the historical celebration of objets d’art, CRAFTED asserts the importance of artisanal skills and aesthetics of beauty within contemporary artistic practice to convey emotion, meaning, and purpose. This exhibition is curated by TEMP co-founders Alex Ahn and Ari Lipkis. Craft can imply the production of a utilitarian object, often the reason art history scholars have dismissed craft from the their lofty realm of study. Elizabeth Tubergen's stairway is an affront to the distinct definition between what can be utilitarian or craft and what is uniquely art. A stairwell has a simple purpose, to transport people from a lower point in a structure to a higher point or visa versa. Tubergen's stairwell is rendered impractical and contrary to the inherent purpose of stairs – instead it is a sculptural work. From her series Falls, Untitled by Alex Posen demonstrates pure elegance. Rippling pieces of sheer silk gently cascade down, evoking a demure sense of rhythm and movement. Posen masterfully uses fabric as expressively as another artist might utilize paint. Her long honed skills in fashion are now serving her meticulously well in art. Posen describes her work as " exploring corporeality and gravity." Reid Strelow’s Wheel is an enormous wooden printing device that is mounted on the wall alongside several of its prints. The piece serves as a beautiful object in itself and as a practical tool to create the accompanying prints. Raul de Nieves, though not a craftsman in the traditional sense, makesfantastical works using a set of techniques that he developed on his own. Raul's shoes, which he often uses during performances with his band Haribo, are dazzlingly assembled with thousands of beads seamlessly joined together. Playing the role of the iconic Superman, Ryan Kelly clumsily constructs the hero’s headquarters in his piece Fortress of Solitude. By making acting out the ordinary job of construction, Kelly presents the difficulty of craft while commenting on the limits of those we idolize.